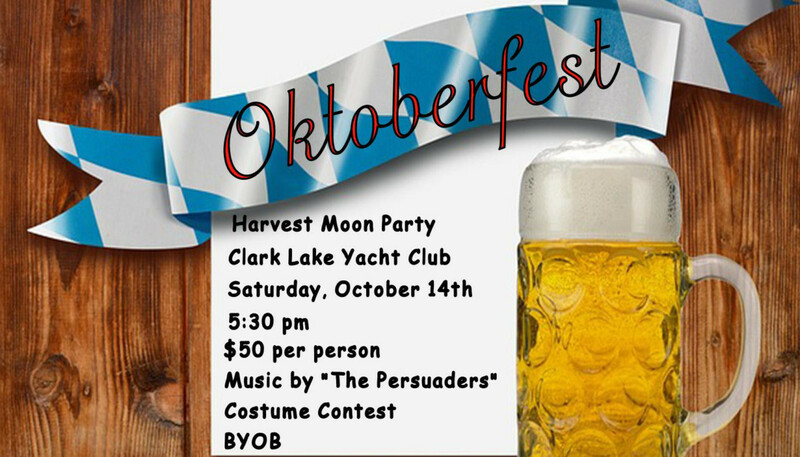 The Clark Lake Community Center has a new venue for the Harvest Moon Party. The party’s new location is the Clark Lake Yacht Club. 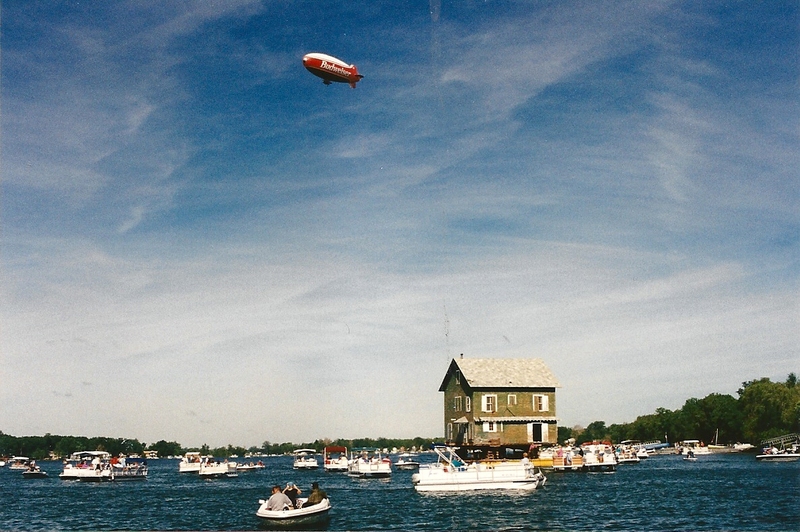 Once known as the Hayes cottage, this historic building has served as the Yacht Club for many years. You can feel the tradition as you enter the great room. The event starts at 5:30 pm on Saturday, October 14. As the Oktoberfest theme suggests, German fare is on the menu–authentic wurst and chicken schnitzel, potato salad, a variety of cheeses, pretzels and dessert. BYOB. The Persuaders will entertain. The band is from Clark Lake, so they ought to know the genre that Clark Lakers enjoy. For those interested in showing their flair for connecting to the theme, the Community Center promises a $100 prize for best costume. Plus don’t miss the 50/50 drawing. If that isn’t enough, you may want to do some shopping. 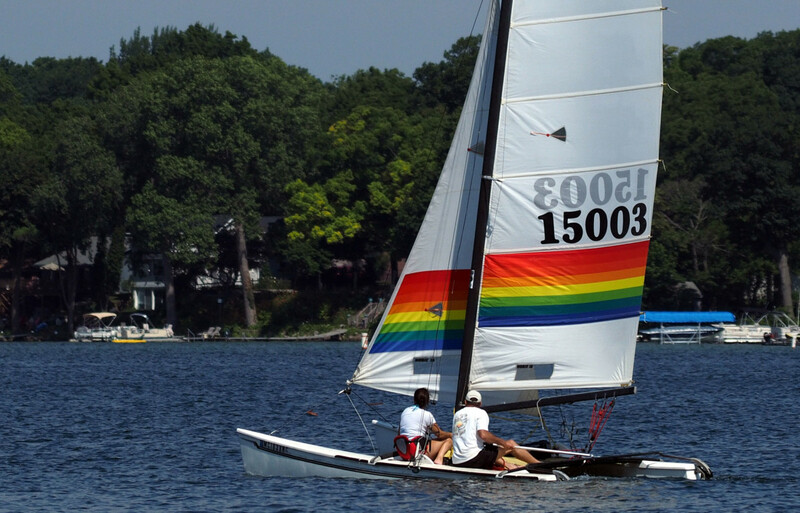 Included in items for bid is an 18-foot Hobie, once sailed competitively by Lynn Vermeulen (sail number 15003). For your tickets ($50 each), mail a check to PO Box 132, Clarklake, MI 49234. More info, contact John Deming at 529-9117 or John Karkheck at 745-2929, email [email protected]. The holiday gift giving season is in full swing, and the Clark Lake Community Center has a suggestion. Their latest offering is now available–exclusive red wine glasses. Previously, the Center featured white wine glasses. The difference? The Wine Enthusiast site tells the story: “Typically Red wine glasses will be a bit taller and have a larger bowl than White wine glasses. In general Reds are bigger and bolder wines so they require a larger glass to allow all those aromas and flavors to emerge.” But no one will stop you from using these glasses for either. 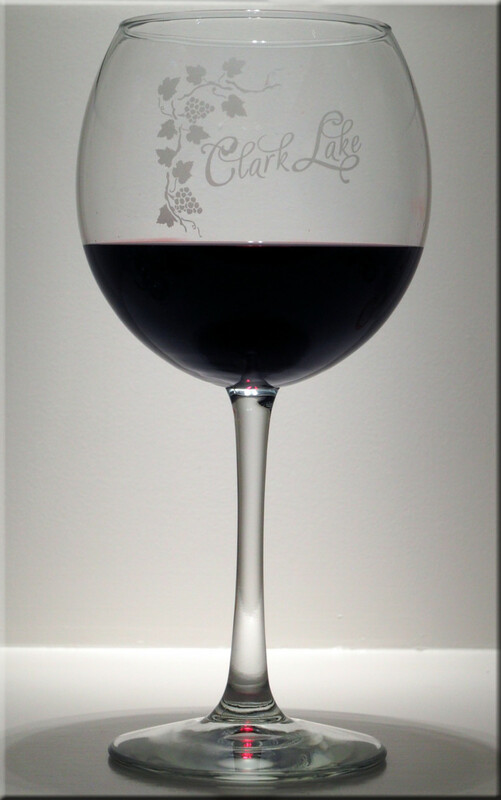 More importantly, the glasses are inscribed with the name of our favorite place–Clark Lake. And with the purchase of each glass, you are helping to support the Clark Lake Community Center. The glasses are $12 each, and you can find them at Doyle’s. With the holidays approaching, strong demand is expected. Supplies are limited. There is a lot to keeping the Clark Lake Community Center looking great and available for the use of the community. Repairs, maintenance, and improvements are a constant concern. This kind of work is supported by fund raisers, as with the wine glasses. And there are those who underwrite needs in other ways. 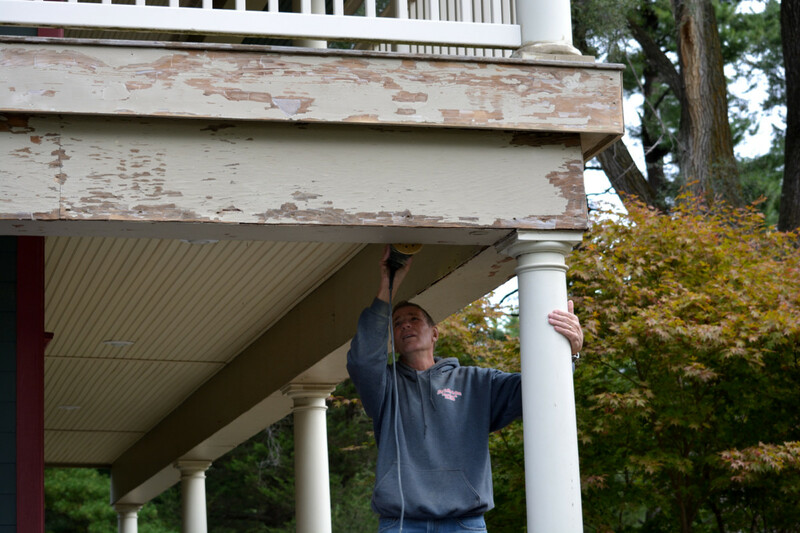 For example, this fall Mike McKay’s company, M-R Builders, repaired the soffits. “Critters try to make this home their home by boring holes into vulnerable areas” according the Community Center Treasurer John Deming. “It doesn’t take much room for a critter to move in.” Mike McKay noted “wood filler plugs will keep the house tight.” In the photo, Jim Roberts is sanding areas to be repainted. 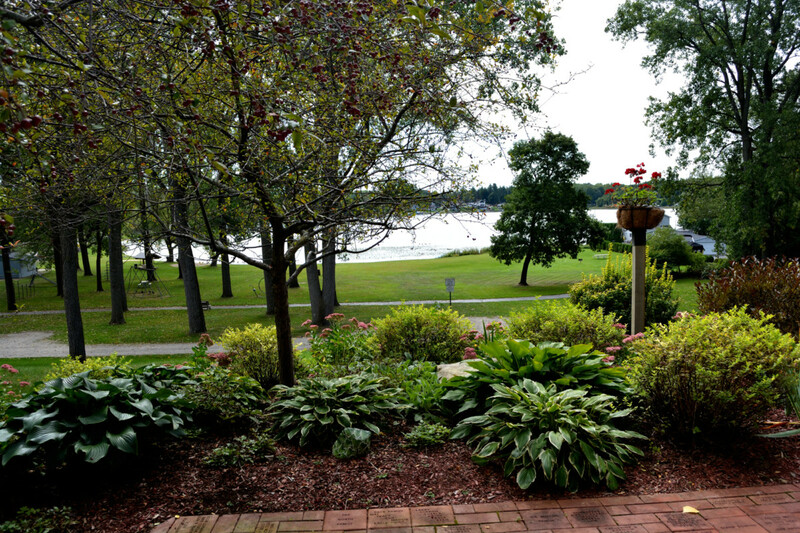 Above, a view of the lake from the porch of the Community Center. The landscaping around the building is the work of the Clark Lake Garden Angels. 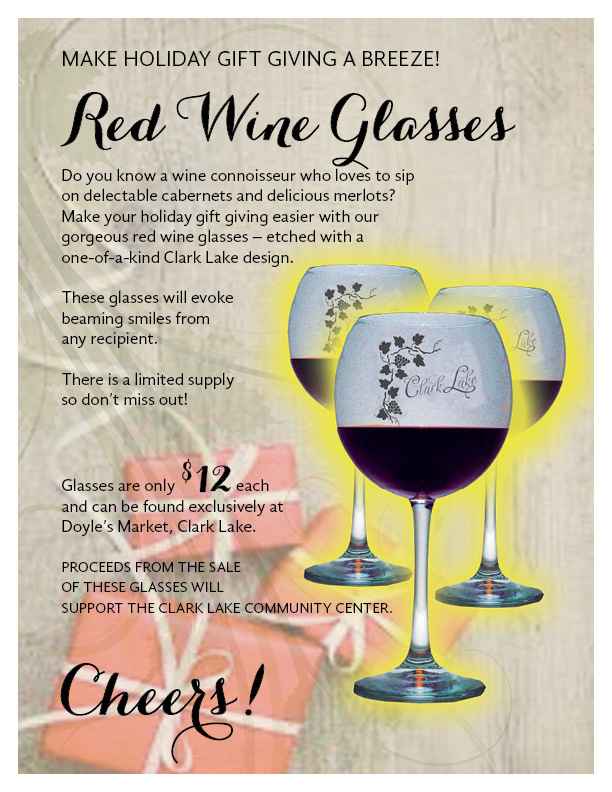 The Clark Lake Community Center’s latest offering is now available–exclusive red wine glasses. Previously, the Center featured white wine glasses. The difference? The Wine Enthusiast site tells the story: “Typically Red wine glasses will be a bit taller and have a larger bowl than White wine glasses. In general Reds are bigger and bolder wines so they require a larger glass to allow all those aromas and flavors to emerge.” But these glasses can be used for either. There is a lot to keeping the Clark Lake Community Center looking great and available for the use of the community. Repairs, maintenance, and improvements are a constant concern. This kind of work is supported by fund raisers, as with the wine glasses. And there are those who underwrite needs in other ways. 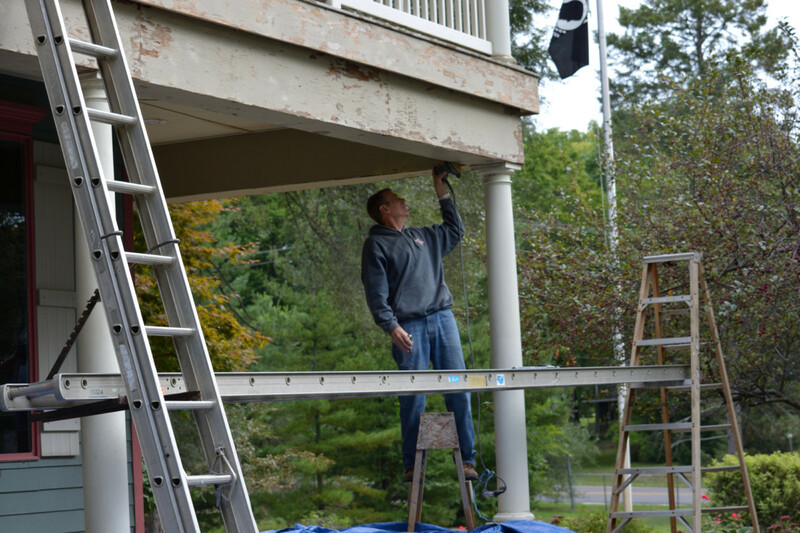 For example, recently Mike McKay’s company, M-R Builders, repaired the soffits. “Critters try to make this home their home by boring holes into vulnerable areas” according the Community Center Treasurer John Deming. “It doesn’t take much room for a critter to move in.” Mike McKay noted “wood filler plugs will keep the house tight.” In the photo, Jim Roberts is sanding areas to be repainted. It may be only a partial facelift, but work is underway to restore areas of the Clark Lake Community Center that have been under siege by nature. Under the watchful of M-R Builder’s Mike McKay, soffits are being mended. “Critters try to make this home their home by boring holes into vulnerable areas” according the Community Center Treasurer John Deming. “It doesn’t take much room for a critter to move in.” Mike McKay comments “we’re using wood filler to plug the holes to keep the house tight.” In the photo, Jim Roberts is sanding some of the area that will eventually be repainted. The Community Center is not a new building. In fact construction was not completed in this century or even the previous one, but in the 19th century. It’s now in its 117th year. 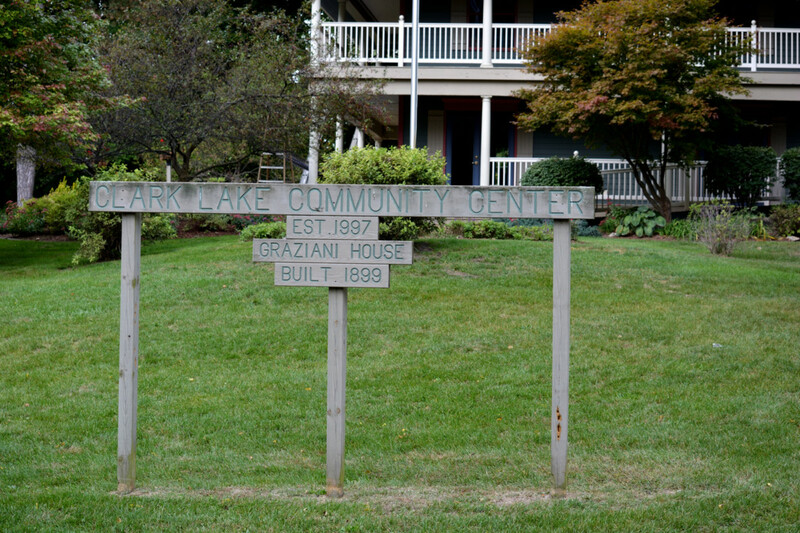 Clark Lake residents love to revisit the story of how the Graziani cottage on Kentucky Point was moved by barge to its present location in the County Park. Not only is the structure itself a significant part of our history, but the process of moving it was a chapter in and of itself. You can read the story of how Benjamin Graziani came to build the cottage and the family’s long occupancy of it by clicking here. The maintenance and improvement of this iconic structure is continuing process. The Community Center board works hard at it. Only part of the expenses are defrayed by rentals, so they look to people who love the idea of what this structure represents to make donations. Click here for details on how to rent the Center for your event and details on the work ahead to keep this part of Clark Lake history well preserved so that it’s an ongoing benefit to residents. Many here have memorialized someone or marked their own affection for the lake through a program created by the Clark Lake Community Center. Please keep reading to find out why now is a good time to take advantage of this opportunity. A brick pathway surrounds three sides of the Community Center building. 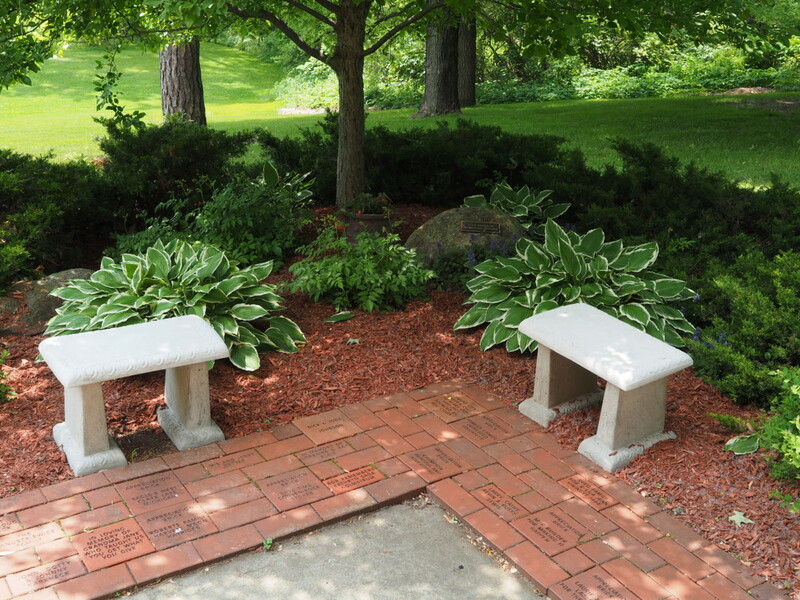 Many of the bricks are engraved with names that have one thing in common–these people love, or have loved, Clark Lake. Family members who have passed, and those very much still with us, are part of it. And in future years, this outward expression of fondness and care for this special place will remain in perpetuity. 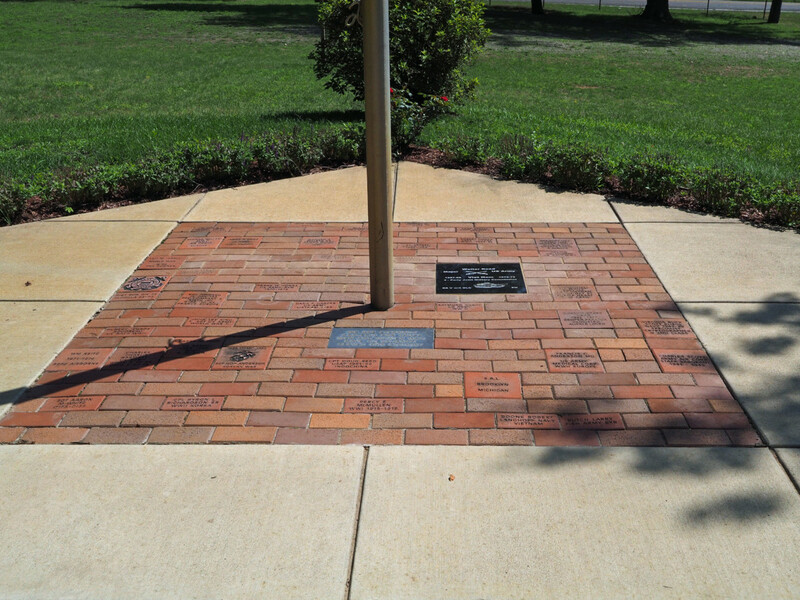 Extended beyond the pathway on the east side of the Community Center is an area that salutes members of the military. A Ring of Honor surrounds the U.S. flag, and here you will find the names of active duty service members or veterans. Both the pathway and the Ring of Honor offer a unique way to show love of Clark Lake and, at the same time, support the Community Center. Click here for details on how to participate. And why now? The deadline is fast approaching for the last order for bricks to be engraved this year. Orders must be received by October 21st for bricks to be implanted this fall. And with the holidays approaching, what better time could there be to consider this as a gift? The Community Center is operated by a group who volunteer their time and effort to its maintenance and improvement. Expenses for upkeep are considerable and donations are always welcome. The Community Center pays Jackson County $1000 per year and is obligated to landscape the upper part of the park. Recently the Center renewed its obligation with the County for another five years. 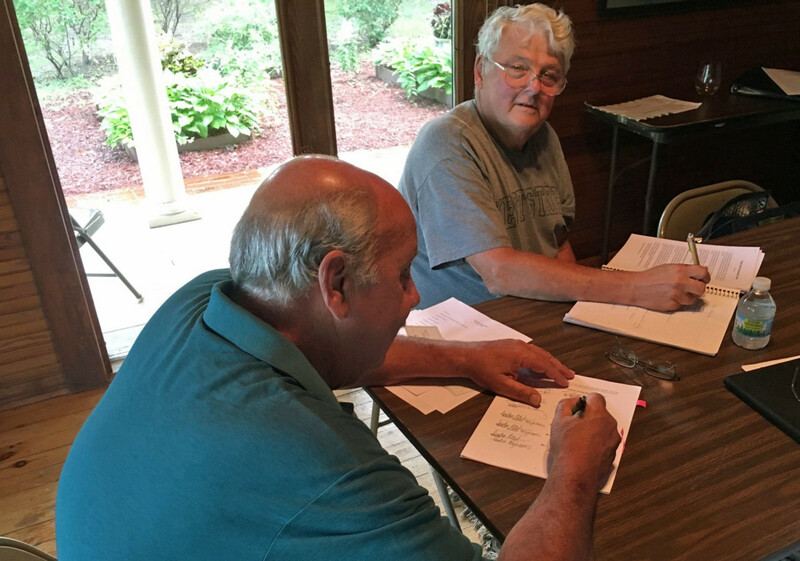 Above, John Karkeck signs the papers sealing the arrangement as Walt Reed looks on.